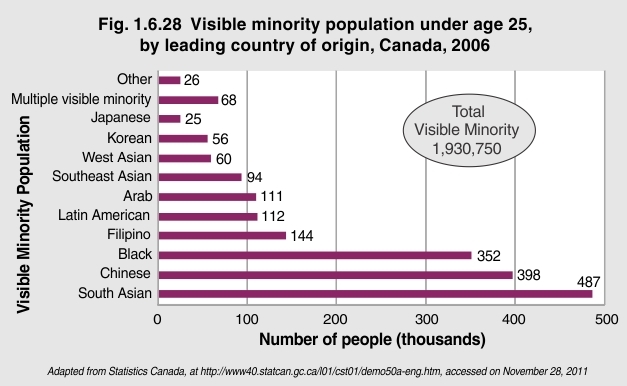 At the time of the 2006 Census, 1,930,750 Canadian children and youth, from birth to 24 years, were visible minorities. They came from a broad range of ethnic and cultural backgrounds. Most were of South Asian (486,630), Chinese (397,855) or Black (351,670) heritage. Many other visible minority children and youth came from the Philippines (143,665), from within Latin America (111,800) and from Arab nations (110,635). There were 93,625 children and youth from Southeast Asia and another 60,030 with roots in unspecified parts of West Asia. Korean children and youth numbered 56,220 in Canada, with 25,190 Japanese children living here. Almost 100,000 visible minority children and youth identified themselves as being either of mixed ethnic heritage (67,730) or as belonging to another ethnic minority (25,680).